The drawers on the Connecticut lowboy that Bob Van Dyke and I found in the back room of the Connecticut Historical Society are tapered from bottom to top. I’ve mentioned in blogs (either here on my blog or on the Popular Woodworking Magazine (PWM) editor’s blog) that I’ve seen this treatment of drawers only one other place, and that was on Grove Wright’s Shaker work, including the Shaker Counter I copied and built in the June 2012 issue (#197) of Popular Woodworking Magazine. 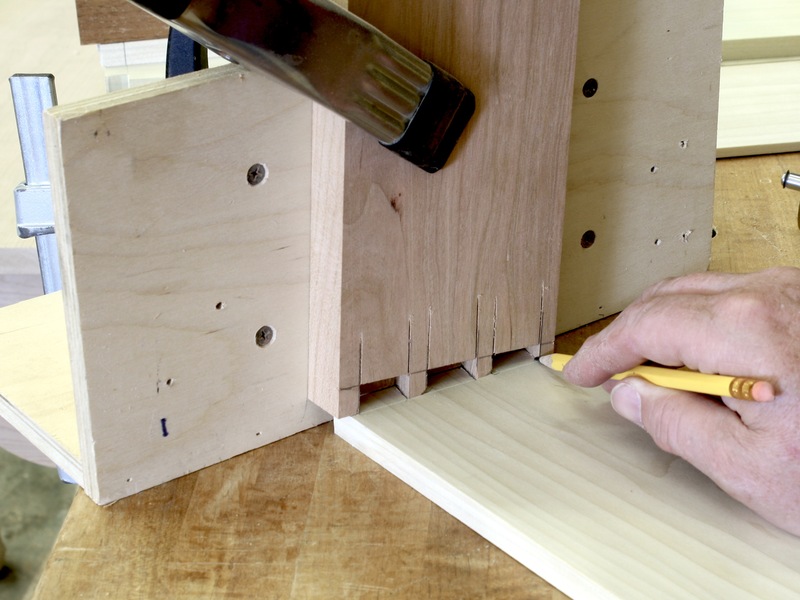 The process of making these drawers is a bit different from regular hand-cut dovetailed drawers. To begin, the material for the drawers sides and back are tapered. Because there are two drawer depths on the one lowboy, there are two different tapers needed on the drawer parts. I set up my band saw to just leave the bottom of the parts uncut, and the top edge to cut leaving a 1/4″. Off the band saw, the cut faces need to be smoothed. That could be a pass over the jointer. But with the narrow edge being only a 1/4″ in thickness, I think it was best to use a jointer plane. It’s from here that things get twisted. I used my marking gauges, but not in a way that is customary when dovetailing drawer parts. I set on gauge to 1/2″ and a second to 1/4″. I used the two gauges to place tick marks at the top (1/4″) and bottom (1/2″) to use as layout lines. 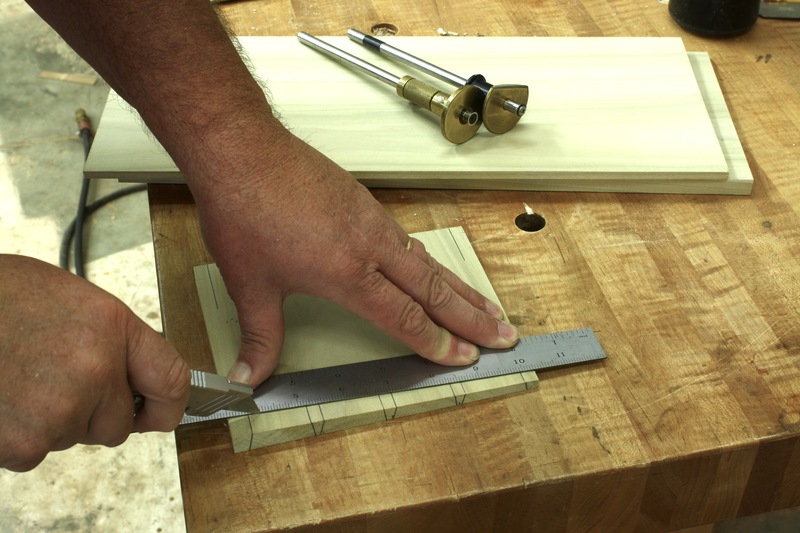 The next step – where you would normally use a marking gauge – I used a straightedge and utility knife to score the baselines. The trick to marking off the pins and tails is to use the square or outside face as a register. (If you use the inside face, your marks can be all kind of funky angles.) After the layout is complete, it’s a matter of sawing to the lines then chopping out the waste. Because I work pins first, I began with the pins in the drawer backs. To transfer the pins to my tail board, I set the completed back in position, making sure the orientation is correct. To cut the tails, I go back to the band saw and cut just off the layout lines, inside the pin waste area. 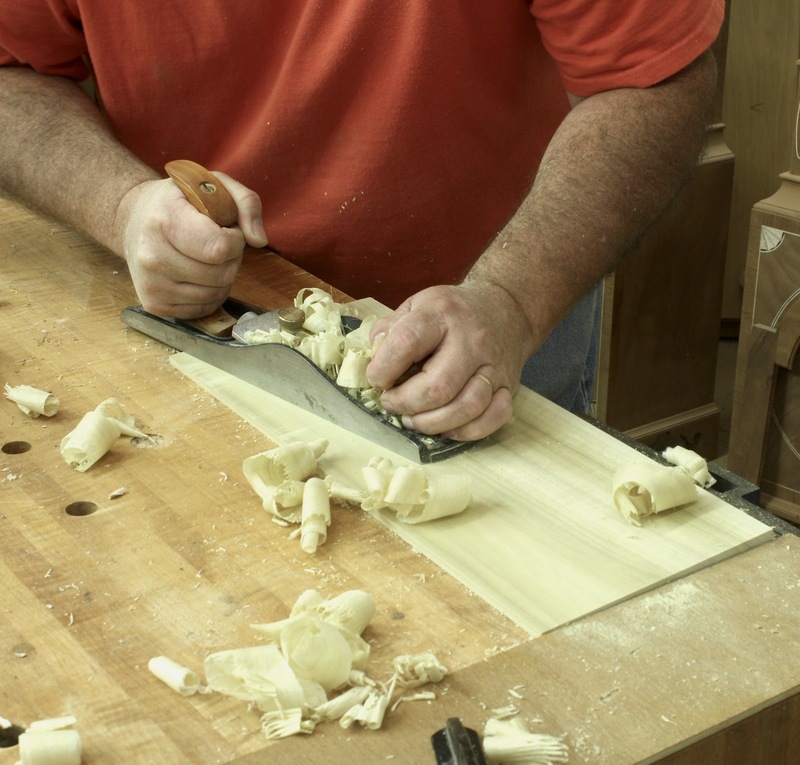 Ordinarily, I would chop the waste at my bench, but because the parts are angled – and the waste area is so narrow – I stay at the band saw and trim the waste using power. Nibble. Nibble. Each time staying just tight to my baseline. Because this is a poplar-to-poplar fit, I get a little smash factor to make it all work. The drawer fronts are not tapered, but the sides are. Again, I have to use the straightedge-and-utility-knife layout method, but from there the process is the same as with standard dovetailed drawers. The only difference is the tail sockets are tapered from top to bottom. To transfer my pins to the tail board (drawer sides), I set the front at my scribe lines, which is a consistent 1/2″, then transfer the lay out. 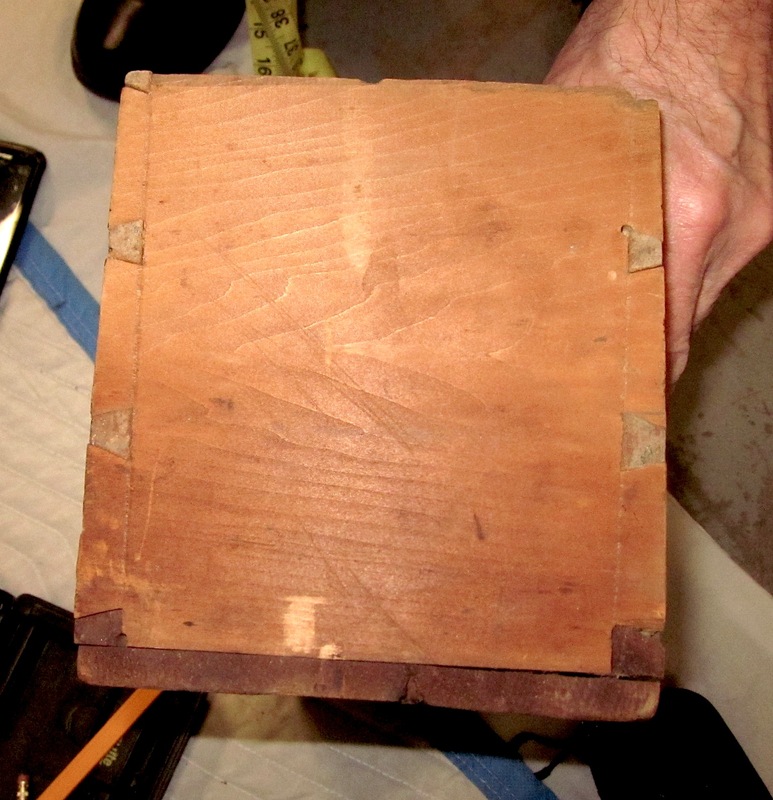 In the drawers of the Shaker Counter, the bottom was slid into the 1/2″ thickness of the bottom edge. The lowboy drawer bottoms at applied – it’s good to have the thickness at the bottom for nailing. I use the counter on a daily basis, and the drawers slide spectacularly. I’m wondering if it’s the design (heavy bottoms) or the yellow pine I used for drawer parts. I’ll have a better picture when the lowboy is wrapped up. This lowboy is an upcoming project in Popular Woodworking Magazine. To see the entire project, pick up the February 2014 magazine – if you’re not a subscriber.